The weather's on the turn, pushing day trippers indoors. So what are the idiosyncratic UK attractions that help us to laugh in the face of inclement conditions, asks Gareth Rubin. Summer defied the apocalyptic predictions of the meteorologists. The sun shone. Al fresco activities became almost second nature to Britons. But as normal weather and reality return, how will we all cope? It shouldn't actually be too hard. Britain has developed arguably the world's greatest range of idiosyncratic days out. Fulfilling the hopes and dreams of pencil fanatics everywhere, visitors can stand below the whopping world's biggest pencil. This behemoth of the stationery world comes in at no less than 8m long. Other nations can keep their world's biggest cakes or most-enjoyable views. Britons do it all a bit differently and prefer things you can't use even if you want to, things that are whimsical and eccentric. We like the big pencil precisely because it is - perhaps ironically - pointless. It is proud to be Britain's only museum of hatting. For some people, hats aren't just natty things to put on your head, they are a whole way of life. A philosophy and a moral code - under which circumstances is it permissible not to tip one's "titfer-tat" at a lady? Do baseball caps fry the brain? All these questions and more can be posed to the staff of the Stockport Hat Museum. The UK's most threatening village is the one where ex-spy Patrick McGoohan was imprisoned in the "what the hell was all that about?" 1960s series The Prisoner. The village itself was built from 1925 in a style that seems specifically designed to make you think you're in some kind of freaky dream where giant balloons will start chasing you into the cold, merciless sea. Imagine a country hamlet built by the love child of Prince Charles and Lady Gaga. It's worse than that. The UK is not known for its space exploration programme. Seemingly based primarily on weather balloons and string, if you tell someone from Nasa that you work at Britain's space centre, there might be a few chuckles. Don't listen to them. We are world leaders in, ummm, some types of satellite technology. All right, there are no rockets blasting off in clouds of fire and dust, no "Leicester, we have a problem" maydays prompting desperate zero-gravity heroics. But there is the wonder of space. There are planets to be seen and ambitions to be seeded. You have to give Basildon points for optimism. A town noted for neither its beauty nor its history, it is defiantly laughing in the face of traditional heritage trails by taking you on a trip around sites that seem exclusively destroyed. There is, for example, the patch of earth that once hosted the Barstable Hundred Moot. But the mooting has long since mooted its own destruction. So why not bring history to life by organising your own moot? The Isle of Arran - "the Marbella of the North" - as no-one has ever called it. Surely the least appropriate location for "clothing optional" bathing, Cleat's Shore, Scotland's only official naturist beach, is the place to seek out if you want to feel the Scottish gales whip around you without hindrance. Frankly, even if you turn up in Arctic gear you might feel a bit of a nip in the air, so hats off to the hardy souls who go starkers. Here, visitors can learn all they ever wished to know about the history of this most loyal and unassuming piece of garden machinery. If you don't visit, you might never learn that the mower was the brainchild of the gloriously named Edwin Beard Budding, who in 1830 attempted to revolutionise the cutting of guardsmen's uniforms. Instead, he accidentally revolutionised Sunday mornings and brought the steady, soothing drone of the mower to suburbs everywhere. Few people know there is a full-scale museum of Creationism in Britain. Exhibits argue that scientific approaches to dating the earth are flawed and the sheer complexity of life demonstrates that animals must have been designed, rather than developing in a random fashion over time. Comments in the visitors' book include "Wonderful to see some dinosaurs in Portsmouth", which sounds undeniably exciting. Whether you're a believer or not, your eyes will be opened. The term "Loch Ness Monster" was actually coined in 1933 by the Inverness Courier, which published the claim of a London man, George Spicer, who insisted he and his wife had seen "the nearest approach to a dragon or pre-historic animal that I have ever seen in my life". So now thousands of people each year spend pleasant afternoons by the water eagerly trying to spot something they probably know deep down is highly unlikely to appear. Many's the toddler drawn by the powerful magic of a yellow digger tearing soil from the ground to dump somewhere a few metres away. 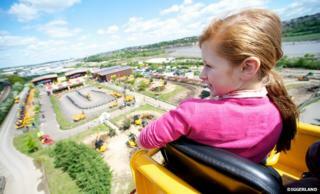 Now, at one of Diggerland's four theme parks, you too can dump piles of earth where there was no pile before. You get to drive and control these mechanical dinosaurs, bending them to your will. With your new-found skills, you can dig up your garden every Sunday to make your terrified neighbours wonder what on earth you are up to.